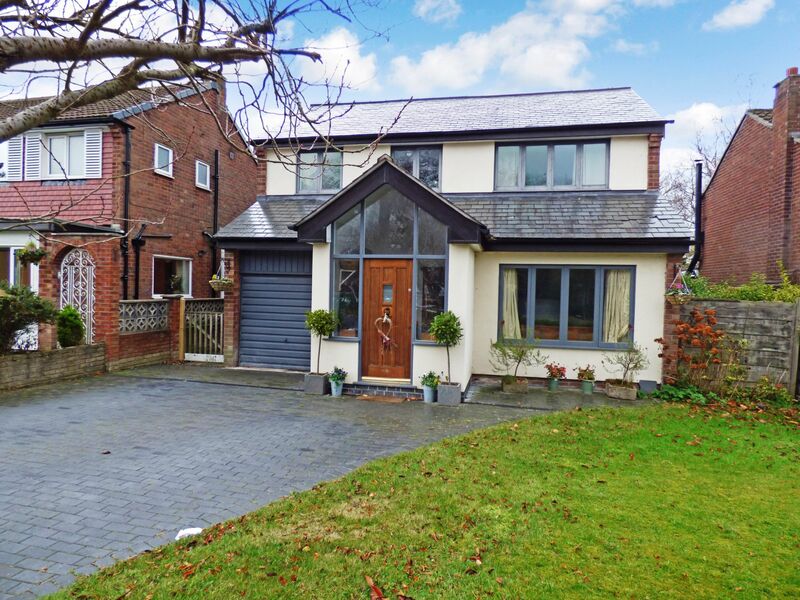 We are pleased to offer this beautifully extended 5 bedroom 2 bathroom detached house, built in the 1960's and offering spacious family accommodation throughout. The property benefits from an open aspect to the rear. Perfectly situated in a highly sought after location and close to good local schools. High Lane village and its facilities are within close proximity. Briefly the accommodation comprises enclosed entrance porch, hall, downstairs WC, large lounge, family room/dining room, open breakfast room/kitchen, landing, 5 bedrooms (the master having an en-suite bathroom), family bathroom/WC, loft room. Advantages include double glazing, combi gas central heating boiler and garage. There are gardens to the front and rear of the property with the rear garden not overlooked. With feature front door, double glazed windows, tiled floor. With Oak wood flooring, radiator, power points, under stairs store, stairs to first floor. With wall mounted wash hand basin, low level suite. With Stovax multi fuel stove with tiled hearth, uPVC double glazed windows and French doors leading to the rear garden, 2 radiators, Oak wood floor, TV aerial, power points. With radiator, double glazed windows, Karndean floor, power points, TV aerial. With a range of base, wall and tall units, granite working surfaces, inset steel sink unit with mixer taps. Smeg duel fuel range cooker, Neff automatic dishwasher, double glazed window to side elevation, uPVC French doors leading to the rear garden, tiled floor, power points, gas point. With double glazed window, power points. With radiator, uPVC double glazed windows with views over rear garden, power points, laminate wood floor. With pannelled bath with mixer taps and shower over with shower screen, wall mounted wash hand basin, wall mounted low level suite, fitted mirrors, tiled floor. With double glazed windows, laminate wood floor, radiator, power points. With radiator, laminate wood floor, uPVC double glazed windows, power points, inset down lighters. With uPVC double glazed windows with views over the rear garden, radiator, inset down lighters, laminate wood floor, power points, stairs to loft room. With laminate wood floor, radiator, double glazed windows, loft access. With Velux double glazed window. With wet area with Rainhead shower, wall mounted wash hand basin, wall mounted low level suite, inset down lighters, towel rail/radiator, uPVC double glazed window, tiled floor, tiled walls. With up and over doors, side door, light and power, water tap, Vaillant combi boiler and water cylinder (recently installed). Gardens to front and rear with lawns, flower beds and patio. There is an open aspect from the rear garden. We undertsand that the tenure is Freehold. From our office, travel along Buxton Road in the direction of Hazel Grove. Turn first right into Andrew Lane. Travel some way along and no. 59 is on the left hand side.